Stainless steel or brass plates for outdors product identification, marine maquines, etc. Its also are usefull for big moulds. 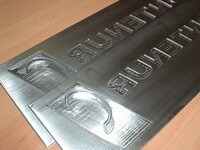 We engrave hight qualitybrass plates for some events. Our brass plates give prestigy elsewere they are placed.